Three young Ōtaki martial artists travelled to bright lights of Auckland last month to compete at the National Championships and pit themselves against some of the top Taekwondo exponents in the country. 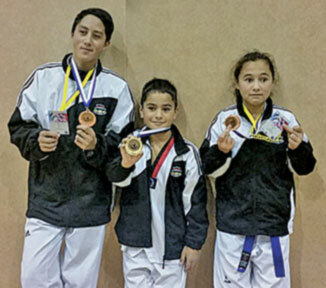 After weeks of extra training sessions under the guidance of Master Jim Babbington and Paula Teau, the trio put their skills, stamina and mental fortitude to the test, with all three fighters coming away with medals. Competing at his first National tournament, 15yr old Tiapo Taumaa has proven he will be one to watch in the future, after showcasing his class and silky skills to gain a Bronze Medal in his grade. He was edged out in his semifinal by the eventual champion, going down by the smallest of margins, but came away from the tournament with new-found confidence and the knowledge that he can foot it with the best in the land. 10yr old Pounamu MacKay was asked to step up a weight and age category to fight against the New Zealand Under 14 Champion in her semifinal, and almost caused the upset of the tournament when she came from behind to draw 7-7 at the final bell! The fight then went into the Golden Point round whereby the first fighter to score a point wins the match. After a hard-fought battle the older girl managed to score first, therefore the win. Despite the narrow loss Pounamu received huge applause from the crowd, praise from the opposition coach and was rewarded with a Bronze Medal in the U14 category — not bad for a 10yr old. Youngest member of the team, Kaahurere MacKay fought his way to the Gold medal in typically dominant fashion outpointing his opponent 16 points to 9 in the final. It was Kaahurere’s second New Zealand title this year albeit in a different sports after he was steerer for the National Waka Ama champion team the “Regulators” in January. After the fight he promptly announced his retirement (at the grand old age of 9) to take up wrestling! After having been at the club for 5 years and won every tournament he entered, Kaahurere will be missed and the Ōtaki TKD wishes him all the best in his new sport. All in all it was a successful tournament with Master Babbington full of praise for his students. He spoke of the pride that the club have in these three competitors. And by the same token, we are lucky as a community to have the services of Jim and Paula who turn up to the college hall every Monday and Wednesday and give up so much of their time and effort to help guide and shape these youngsters into top athletes.